With the right ammunition, the potent PT 740 is most likely a gun that will be carried a lot but shot little unless you are shooting masochist. I need to make a confession. After several blissful, totally reliable months of sharing my life with Taurus' successful PT 709 Slim pistol in 9mm, I have begun to see its more buxom cousin, the still svelte PT 740 in .40 S&W. This reluctant decision has involved sacrifices--such as the loss of one to two rounds depending on the magazine employed--but admirably the bigger-bored beauty kept her weight the same as the 9mm at only 19 ounces. However, her temperament is more spirited than her older sister's, and she is a bit harder to handle. Nevertheless, looking ahead to winter in my part of the world, which means multiple layers of clothing that can give some hollowpoint rounds fits, I'm comforted by the larger, heavier bullets the 740 can deliver. You have to look very closely to determine if you're holding the PT 709 or the 740. Both have similar dimensions and controls, and both have carbon or stainless steel slides with fully adjustable sights and polymer frames with enhanced grips. Simple point-and-shoot pistols are fine, but I appreciate multiple intuitive active and passive safeties--especially on small guns that are designed for sub rosa carry and may also end up in purses or fanny packs. In addition to a prominent thumb safety and loaded-chamber indicator, the 740 comes equipped with a reciprocating trigger safety, firing pin block and Taurus' keyed Security System. The six-round steel magazines have round count holes, bright orange followers and sturdy polymer base pads to ensure seating. To speed reloading the 740, the upper rear edge of the magazine should be placed against the grip extension and rocked into the beveled magazine well. Fresh out of the box, I shot a 1.32-inch group from a handheld rest at 15 yards with Federal 180-grain HST JHP, but it was several inches low and left. I made numerous sight adjustments in an attempt to make the point of aim coincide with point of impact, but I eventually ran out of sight travel for both windage and elevation. Upon closer inspection, I discovered the front sight was not true, and rear edge was turned slightly to the right. I defaulted to Kentucky windage; it required a one o'clock hold to hit the center of a Birchwood Casey Shoot-N-C. All subsequent groups fired were relatively decent with ammunition ranging from 165 to 180 grains. There is no free lunch, though. When you stuff a larger and heavier caliber round in a pistol that started out as an ultralight 9mm, you are bound to get more robust recoil and muzzle flip. Well, I was not disappointed. The 740 will give your hands a healthy workout regardless of the bullet weight fired. 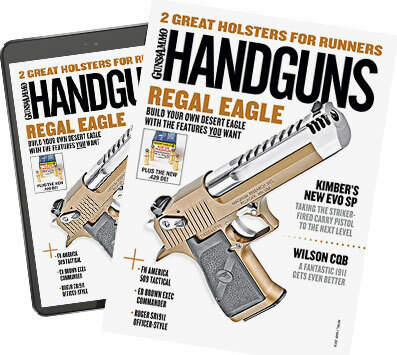 This is a sidearm for a seasoned and well-conditioned shooter. Reliability was 100 percent. The 740 features a unique single-action/double-action trigger. When a round is chambered, the striker is fully cocked, and the SA trigger merely releases the sear. With this arrangement, there is a considerable amount of takeup or slack before sear resistance is encountered. Once resistance is overcome, the trigger breaks cleanly and the pistol fires. This action continues until the 740 is empty or there is a misfire or other stoppage occurs. With the pistol's smooth double-action "restrike" capability, the shooter gets another whack at what may be a hard primer. The second-strike capability is controversial among some professional trainers, who recommend immediate action (Tap, Rack, Bang) rather than continuously hammering away at a dud primer. Aside from the disappointing quality control regarding the sights, fit and finish was very good. The PT 740 Slim comes in a lockable padded plastic case, an additional six round magazine, security key and tool and manuals. With the right ammunition, the potent PT 740 is most likely a gun that will be carried a lot but shot little unless you are shooting masochist. For those hardy souls who thrive on guns that let you know unequivocally when they have been triggered, the tiny Taurus 740 will serve admirably as a reliable and powerful deep concealment or backup handgun.